Talal El Karkouri is out, and will probably now play in Qatar as has been rumoured. Jimmy Floyd Hasselbaink is officially now gone, although notice of his impending departure came some weeks back. Wingers Myles Weston and Alastair John both leave without making a first team appearance. Nathan Ashton did get one game (cup versus Carlisle) but didn't look the part, and other young left backs are being preferred. Rurik Gislason has a reputation, but it seemed that it was for being injured at the wrong time, rather than the potential to be the next Eidur Gudjohnsson. And finally, Kevin Lisbie, or should that be Super Kevin Lisbie, always the epitome of a young striker on the verge of a a first team breakthough, can now justify his tag at another club (Possibly Gillingham?). These departures, along with Bryan Hughes and Darren Bent who also left Charlton this week, could reduce the wage bill by as much as £125,000 a week. In the curtrent climate, that is money well saved. Other news, Darren Bent spent his first day as a fully fledged Spurs player watching the rain come down at Wimbledon; interviewed by BBC as a fill in while no play was in progress, it did rankle that the caption had him as "England and Tottenham Hotspur". As ever, he had kind words to say about Charlton and hoped the money gained from his transfer would be put to good use at the club. And (allegedly) spending some of the cash from the sale of Darren Bent today was Charlton Director and former Chairman Richard Collins, driving his Rolls Royce with personalised number plate into the car clean and shine place in Sherman Road, Bromley. I guess he will want to have it looking all spick and span when he parks it next to the players cars in the car parks at Sparrows Lane or The Valley over the coming few weeks. I was inevitable really, even though Peter Varney suggested that Darren Bent may still be with the Addicks come the start of the new Championship season, Dazza is now a Spurs player. We did get most of what we wanted as a transfer fee, but not quite the £17million that West Ham were willing to pay. The deal is £15.5m down, with another £1m in add-on fees (probably goal or appearance related). We had two seasons worth out of the former Ipswich player, and two great seasons it was (for him) that he wore the Charlton number 10 shirt. Off the mark with two goals on his debut at The Stadium Of Light, he hit 22 goals in his first year with the Addicks. Last season, the relegation year, he was not so prolific, but even though hit by a serious knee injury that ruled him out between December and February, he still ended up the second highest scoring English forward in the league, with 13 goals. I will always have a soft spot for Dazza. he always tried his best; led by example; urged on his team-mates; and did the club proud at every opportunity. I wish him good luck at White Hart Lane, and hope that his future includes a permanent place in the England set up, where he belongs. Hopefully, his trasfer fee will go some way to putting the club back on an even keel financially. It's not all bad news though, as Bryan Hughes also left the club today, on a free transfer to Hull City. Well, Darren Bent is still a Charlton player (just); no club has met Peter Varney's valuation since Dazza was allowed to talk to (and turn down) West Ham, although Benty himself has said that Spurs have upped their offer twice. 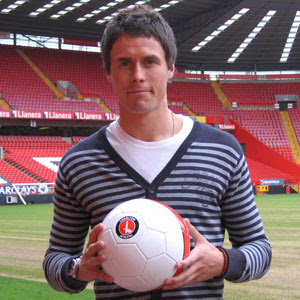 According to Sky Sports News, he now feels that Charlton should reduce their asking price so he can at least talk terms. 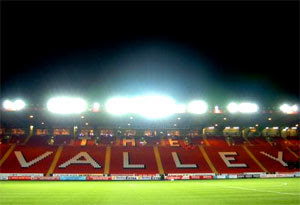 From the Charlton perspective, other clubs may yet come up with the spondoolicks! Arsenal are Thierry Henry-less, but have a nice £16million (which just happens to be very close to what Charlton want...) burning a hole in their pocket. Liverpool undoubtedly want Fernando Torres as their first choice signing, but if their £25m offer (possibly including Crouch going the other way?) is turned down by Athletico Madrid, then they may yet move on to their second/third choice strikers, which would definitely then include our Dazza. And let's not rule out Seville; Freddie Kanoute was last week rumoured to be after a move back to the Premiership, and his loss would leave a big gap in the forward line there, one which Dazza may have filled? Now, though, Kanoute is apparently happy again, so that option is less likely. I spent the weekend thinking about the Carlos Tevez saga, which is dragging on following the arbitration panel delaying a decision on West Ham's (and Sheffield United's) fate for a couple of weeks more. How about if West Ham are docked points, then the Blades are also docked points for insisting Kazim-Richards didn't play for Watford aginst them although he was not their player following his January transfer? Could that be a Premiership lifeline for the Addicks? Maybe not, as Charlton could then be docked points for allegedly tapping up Dowie? Crazy eh!?! My own view on this latest delay is that the panel are taking legal advice, which means that they do want to penalise the Hammers. This may yet be a larger fine though, with compensation going to the Blades, rather than relegation, but who knows. Whatever happens, the solicitors are getting paid plenty! Lots of rumours about who has left the club - Talal El Karkouri (left) is almost certainly going, and to Qatar, but officially he is a Charlton player until next week (1st July) when his contract ends. Bryan Hughes is the latest rumoured to be off too, with Hull his possible destination. Radostin Kishishev has definitely gone out the door, joining Leicester on a freebie. These three have all had good and bad moments on Charlton shirts over recent years, but personally I am not sorry to see any of them leave. All tried hard, but were not the most blessed players; all scored vital goals - Kish his only two in consecutive home games; Hoozey many against lower league teams in the cup; and the Elk some of the best, including a fantastic free kick against the Arsenal on New Years Day three years back. Good luck wherever you all end up, just don't score against us in future! Luke Young is well rumoured to be on his way (Villa/Newcastle/Portsmouth? ), as is Dennis Rommedahl (Rennes? ); I guess well know more about their fates over the coming month or so, but I doubt very much either will wear a Charlton shirt in anger again. And we have two, count 'em, two new signings from abroad, and both defenders. 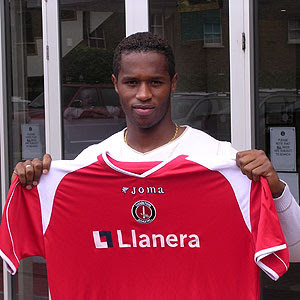 I must admit I thought that French right back Yassin Moutaouakil might be our last defender (joining Sankofa, Bougherra, Diawara, McCarthy, Thatcher, Youga and the ghostly Gibbs), but no, today we signed Jose Semedo (left) on a freebie from a Portuguese second division club. You do wonder, if he is that highly rated, why couldn't he get into his own club side, but then, he was loaned out to Serie A in Italy and did get a game there... I just hope that these two are seen as first team players and not more in the Kelly Youga/Jani Tanska category (though they do both seem to be higher quality). Well how about that then!!! 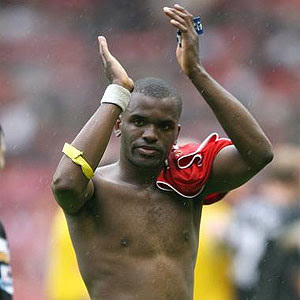 Darren Bent turns down the Hammers. If the stories contained in the tabloids and on the various interweb sites are true, he was offered either a four or five year contract, and a salary of between £60,000 and £80,000 a year by Alan Curbishley. Obviously either not enough, or something else caused Dazza to turn down West Ham. 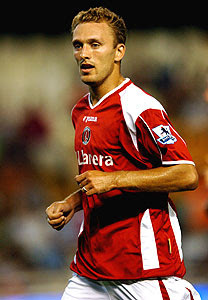 Of course, we dream about Dazza announcing tomorrow that his heart is at Charlton, as we gave him his chance, and that he has decided to stay with us and enable us to smash our way out of the Championship this season, but we all know that is unlikely. More sensible, is that Dazza has been talking to Liverpool, or maybe Spurs, or even that he really does fancy the Champions League from a Spanish angle with Valencia? Of course, West Ham could yet come back with an improved offer for our number ten, the best English striker over the last two seasons, a proven Premiership goalscorer, and very loyal subject! We read about comparisons between Dazza and other strikers - Defoe, Owen, Rooney, Crouch, even David Nugent! Well, us Charlton fans know that he can be as good as anyone who has played for England since Michael Owen was in his pomp, Alan Shearer was world class, Gary Lineker was banging in World Cup hat-tricks, and Nat Lofthouse was a Lion of Vienna! West Ham fans won't believe it; they will be gutted and saying how can a player who plays for little old Charlton turn down a big club. They will be scathing of him! Well, maybe Dazza knows that West Ham could also be in the Championship next year. Maybe he doesn't want to join a club that blatantly broke the rules last season and, initially at least, got away with it. Maybe it's just that West Ham aren't a big enough club for our Dazza! I read one comment from someone today on the message boards that said why would Dazza go to West Ham; it would ruin his career. He should join a big club who will look after him, nurture him, surround him with good players, and take him to the next level. The only clubs Dazza should consider were Manchester United, Liverpool, or Arsenal. Maybe Dazza reads the Charlton message boards and agrees! Things seem to be chuntering along one the Charlton front, but no main news to get too excited or depressed about. Welcome to Paddy McCarthy (left), formerly captain of Leicester, who joins our defence, offering a solidity and accent we have sorely missed. Leicester fans seemed aggrieved at his departure, but then started to say he wouldn’t be missed…The Foxes results did pick up toward the end of the season, when McCarthy was injured, so they may have a pint, but his signing is welcome when there is still uncertainty around who will still be at the Valley next season. No real news about any transfers out of the club; Dazza, Rommers, Thomas, Lukey and Big Benty all seem to get mentions, but not much seems to happen. Luke Young is being linked with any Premiership club that needs a right back – Villa, Newcastle, Everton. If we get £2 million, I don’t care if he goes. Dennis Rommedahl (left) was today linked with the French club Rennes, for Half a Million quid. I imagine our flying Dane will be sprinting down to the Eurostar station imminently…Bye Dennis! Big Marcus Bent is still with Daniella Lloyd, so no transfer activity there…although many rumours abound! The Jerome Thomas to Birmingham story has fallen flat; I didn’t think that £1.8m bid could be real! I wouldn’t be too bothered by the initial release though, as we can then look forward to Sky re-arranging many of our games to fill their Championship TV schedule; those who moan at Sunday afternoon and Monday night games…get ready for Friday nights and Saturday or Sunday lunchtimes!!! Me, I’m going to miss the first Saturday game due to holiday, and maybe the third weekend too! Please then Mr Fixture Computer, make those away games, but not Scunthorpe, Blackpool, or Preston!